This entry was posted in Campaign stuff, FOI, General Medical Council, GMC, Inquest stuff, Jeremy Hunt, Jeremy Hunt, Laughing boy tales, NHS England, NMC, Oxfordshire County Council, Sloven Health, Southern Health NHS Foundation Trust by sarasiobhan. Bookmark the permalink. I am so sorry Sara. She’s accusing the GMC of coming to a ‘fraudulent result’?!? They are stoning you Sara – for holding on. For sustaining your bright intelligence, your courage and integrity, while being battered by arrogance and ignorance..
We ‘pushy ‘ mums are all stoned for committing the same sins. . We all live a life in a hail storm – of sharp stones, that kill…. and.. can break our spirit unless we sinners – all stand together – and call the bullies out. Horrified! On what planet does Jennifer Spencer live? I’m so sorry that some people feel they are above the law and that they can disrespect the decision of a evidence based tribunal. I also think you should know that a man who undertook stalking and other unhand deceitful actions including threatening to report me to the police! (I asked if he wanted me to hand myself in after this) has shared a LinkedIn link via Twitter which shows Dr Spencer’s quite whining disrespect for a legally recognised and respected tribunal. I hope your ok I’m telling you this as I do believe knowledge is power. If you wish to know more please contact via email as I find it very difficult to access the Twitter site. The message came via Twitter email notifications. How selfish. So heartless . The medical mafia rears its ugly head again. 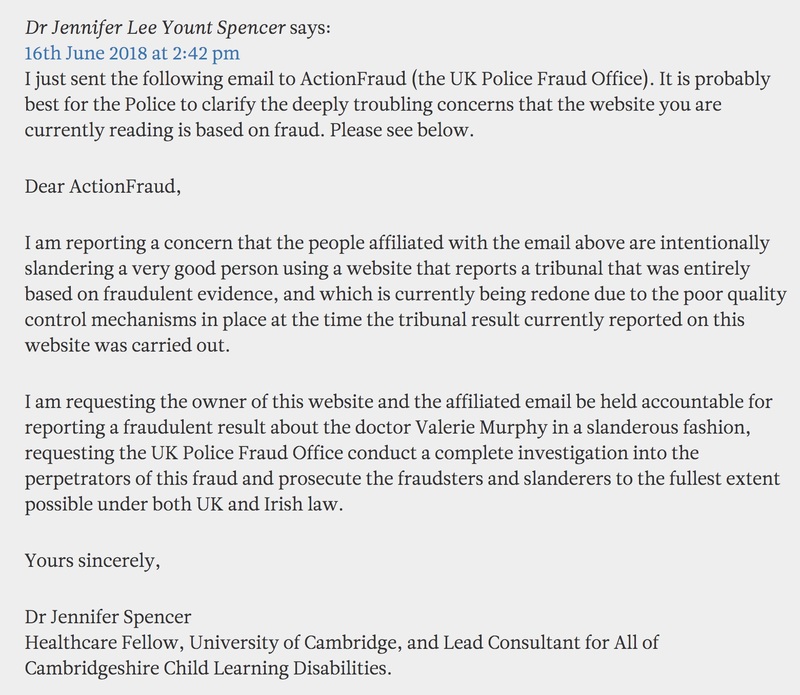 Surely by denying the validity of an independent tribunal judgement and accusing those who contributed evidence supporting this judgement of fraud, Jennifer Spencer is herself guilty of the crime of slander? Not to speak of a quite staggering lack of self-awareness and sensitivity for a clinical psychiatrist with responsibility for the care of children with Learning Disabilities. I would be interested to know how her employer @Cambridge_Uni appreciate being associated with this unwarranted attack on a bereaved mother? Jennifer Spencer clearly has a conflict of interest if she’s defending her friend who already admitted she did wrong. I know several psychiatrists who are not at all like Valerie Murphy, so there must be others I don’t know, and they probably cringe every time they read this sort of malicious statement, so projecting onto the victims isn’t all doctors sticking together, just maybe those who are into bad practice and need to be exposed. A key requirement of Good Medical Practice (as published by the GMC) is that doctors’ conduct justifies the public’s trust in the profession. I would argue that Jennifer Spencer’s actions bring the profession, the GMC and the MPTS into disrepute. There is a compelling argument that she brings Cambridge University into disrepute too and also that she is wasting police time. There are basic legal flaws in her letter to Action Fraud but I am not going to rehearse them here and possibly give her an opportunity to remedy them. Finally, if Valerie Murphy believes she has been slandered, why doesn’t she bring a civil action against the alleged perpetrators – no doubt Jennifer Spencer would help fund it! I often read your posts as I was in healthcare but not at the slade when all this happened. LB’s death was, remains, and will remain a source of sadness and I am with you in this. What is sad is how information trickles down to the family, who just want an explanation of how this happened. There are things still not out in the open about your sons care. I dont know why NHS trusts hide these things. As far as doctors are concerned, there was supposed to be a lot of cover on that unit. You may or may not already know this from the tribunal, Dr Murphy was during the time in question in 2013, away from work a lot, having treatment for a very serious form of cancer. She had asked for help with cover. The cover during regular sickness absence and help through this time was supposed to be a Dr Lewis and Dr Stephenson doing regular sessions on the unit. There was little mention of them in the tribunal but you may know more why that was. There was another Doctor – Dr Jayawant who was a good doctor with lots of experience who was around. There were a lot of nurses around, some very good and with lots of experience. I knew one of them personally and he cared deeply. There were layers of managers to over see the unit. So its difficult for anyone to understand some aspects of what happened. It must be a 100 times more difficult for you and your family. There are other aspects of southern health trust, some very upsetting but some which you will find reassuring, which I will write about to you in due course, perhaps privately if you would like this, but I appreciate you may not.I deeply respect that you are ensuring learning from the LeDeR review. My thoughts and prayers are with you and your family over the next few weeks. Dr Jennifer Spencer, for all her qualifications and position, doesn’t understand the difference between slander and libel. Nor I suspect does she understand the principle of ‘Qualified Privilege’ in which the public interest outweighs the individual’s interest. Quite. Or the fact that the Fraud Squad doesn’t pursue people for slander (or libel) they have better things to do. If its any consolation she comes across as deranged. If I were the poor sod receiving this overblown, incoherent rant at Action Fraud I would roll my eyes and say “Oh, Gawd, another nutter…” and put it on the pile with the green ink letters demanding that the government be charged with fraud for breaking election promises. I bet they get this kind of thing all the time. Have just checked the GMC Register – it appears that Dr Jennifer Spencer is now suspended!! !Perhaps Action Fraud had the good sense to ask the GMC to deal with it.